In Africa time ticks a little slower. At least in rural Africa this is very visible. Here, time is marked by daily occurrences. It starts just before sunrise where the start of a new day is announced by a very eager village rooster. Cows are milked. Goats and sheep are being herded to their grazing fields. Fresh bread is baked early morning, wrapped up in cloth and balancing in tin containers on the women’s heads as they share their handiwork with their neighbours in the homestead. The young ones are off to school and the older Mamas in the village are working the fields, fetching water and collecting wood. An African bush sunset greets the day and welcomes the evening. Guinea fowl flocking towards their sleeping tree… each evening almost on queue. Cattle shuffle back to their kraal. The zebras quench their thirst at a nearby waterhole… and as the dust settles, the owls awake and the lion begins to prowl. Fragrant wood fired smoke travels for miles, with “sadza” (maize porridge) cooking away and corn cobs toasting on the coals. Bedtime stories are told around the fire. For us on the periphery it’s a bit faster. Terms like “just now”, “I’m on my way”, “Now Now”, “Shortly”, “Eventually”, “Whenever”… We don’t really grasp. Especially if you are not tuned in. African time is not necessarily about punctuality. Time is not a consideration here. So “being late“ or “being early” is mostly misunderstood. It is about the priority of events and what is happening at any given moment. For me, it is most inspirational to get into our Land Rover, and disappear over the horizon, in search for those artisans in rural areas that are keeping it all alive. Rural Africa has its own clock. You also find Africa’s most treasured gems here, if you are willing to look. If you consider that the artists and artisans in these areas, sometimes have to travel for miles to get supplies, it is quite extraordinary how powerful imagination and creativity really is. 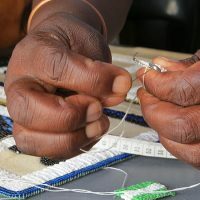 A simple beaded bracelet, can take several hours to string together into a pattern that is enticing for the eye of the consumer. 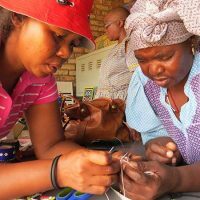 For instance, the intricate beadwork our artisans painstakingly stitch onto our beautifully handcrafted leather bags, take days and an abundance of patience – something we don’t always understand or appreciate fully. We brush it off as unimportant or something I’ll learn about when I’m retired, because right now “I don’t have time”. Well, it is here where you learn the values of life in its most simplistic form. People, no matter where they live, just want to survive. They want to interact in a social group where they are respectfully cared for and where they can affect and influence others destinies. 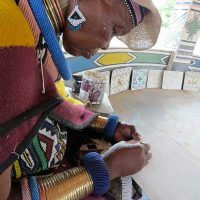 Artists, artisans and village elders want to pass their knowledge and crafting skills, family and cultural traditions onto the younger generations. People want to have the freedom to express themselves and this happens through the arts in all its forms – from forming choirs, dancing groups, making traditional outfits and shoes to teaching the secret recipes of that bread or stew or curry, painting their houses and getting involved in beadwork or any of the other many crafts. Through this craftwork, time itself is actually manufactured and presented to you, the recipient, in a handcrafted piece, immersed in an age-old history. Is this not true wealth? This is what we support as the artist is the one who still has pride, is still productive and is still causing change in society. Beautiful descriptions of our awesome continent.